JAINA Newsletter:Jainism In History Textbook, 26 Jains Embraced Monkhood In India, Jain Center News. The year end is soon approaching and JAINA appeals you all to donate to your organization JAINA and also avail tax benefits under Income Tax Rules. Please go to the link DONATE and do the needful. Donors above USD 250 would be recognized in JAINA Newsletter also. 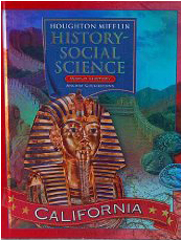 We proudly announce that Jainism has been included in the California's History-Social Science text books framework in 2016. We appreciate the by JAINA's Girish Shah and immediate Past President Ashok Domadia and other community leaders. Just as I do not like misery, so do others. Knowing this, one neither kills, nor gets killed. A sramana is so called because he behaves equanimously. 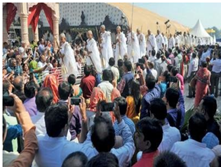 Twenty-six Jains from Ahmedabad and Mumbai renounced family life and embrace monk-hood on Saturday November 25, 2017 at Sabarmati Riverfront - Ahmedabad, India. The four-day 'Vishwananda Utsav' culminated with Diksha. On Friday, a 10 km procession was organized in which those about to be initiated into monk-hood participated with their families. The ceremony took place under the aegis of Acharya Yogtilaksuri Maharaj Saheb. .
Jainism was for the first time added to the California's History Social Science textbooks framework in 2016 due to the efforts of Jain and Hindu community members including JAINA's Girish Shah and immediate Past President Ashok Domadia, organizations including Jain Center of Southern California, Hindu American Foundation and Hindu Education Foundation.
" Mahavira, another successful wandering teacher around the same time as Siddhartha, was a teacher of Jainism. Jainism and Buddhism developed at the same time. A main characteristic of Jainism was the idea of Ahimsa, which is non-violence to all life. As such, Jainism encourages vegetarianism. The path to enlightenment comes through non-violence. Jainism continues to play role in India today. Mohandas Gandhi, a well-known peace activist in India in the first half of the twentieth century, practiced non-violent protest. He protested against British Rule in India." This was a major victory for all Jain and Hindu Americans. While some publishers have incorporated content on Jain teachings in sixth-grade textbooks, some are yet to do so. But again this is a very good beginning. We should all continue to work to get an accurate and balanced view of Indian history in textbooks which includes its spiritual and intellectual traditions. Kudos to all parents and community members who are part of this great movement. Q: Who are the Arihant Bhagwans? Q: What are the different types of Arihant Bhagwans? This is another must see. Just after Neminath temple, make a slight left, where you will see the doorway to the Window of Virtue and Sin. 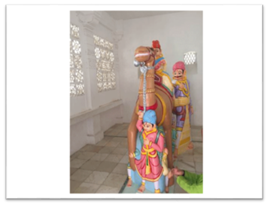 It is a freestanding room housing a statue of a man mounted on a camel with the caretaker standing beside the camel. The test for all visitors is to get down on the floor and crawl through the small space between the camel’s legs. It is said that only virtuous people will succeed. Try it out – it doesn’t matter if you’re young or old, skinny or plump – you may find that you’ll succeed! Why is it a camel and not an elephant or a horse? The story is this: 800 years ago, a wealthy man vowed to come to worship Adinath here on this peak on a particular day each year. He fasted for the three days it took him to travel here and broke his fast after he finished the pilgrimage. He did this diligently every year. One year, it was exceptionally hot. The master, camel, and caretaker were all exhausted and dehydrated but since the master would not break his vow and drink water, the caretaker and camel did not either. They reached the base of the hill, only to drop dead from exhaustion. In memory of such great devotion and knowing that the man’s last wish has come to Adinath, this statue was made and placed here. Once you’ve passed the test, our next stop is a temple 100 pillars. Click to read the story & listen to an amazing audio clip in English or Gujarati. A little bit ahead, just across from the Windows of Virtue and Sins is a temple that has a hundred pillars. The pillars are laid out such that none of them block your view of the Chaumukhi or four-faced main idol. 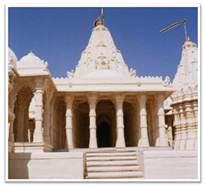 The temple is styled after the famous Ranakpur temple in Rajasthan. The temple dates back to the 16th century. King Vijayachandra was the ruler of Kamrup city. In the same city, there lived a merchant named Sanghdatta, who had a son called Kesari. The merchant was known for his honesty, but his son was not. He was a thief. The merchant tried hard to change him, but he could not succeed. He was so fed up with his son's habit that he gave up on him. The merchant went to the king and brought this matter to his attention. He said, "I am ashamed that my son is like that. Please, you take care of him, because I do not want to have anything to do with him." 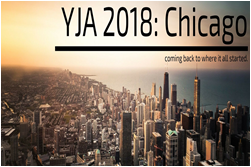 YJA is excited to announce that the 2018 YJA Convention will be held in Chicago, IL at the Westin O'Hare from July 5th - 8th! Chicago youth are excited to bring their peers from around the country back to where it all started - the host city of the first YJA Convention. If you're interested in being involved, please apply to become part of a sub-committee here. A 1: Arihant Bhagwans are Kevalis or Jinas who have conquered their inner passions and have destroyed their all four Ghati Karmas. A 2: There are two types of Arihant Bhagwans. They are Ordinary Arihants and Tirthankar Arihants.